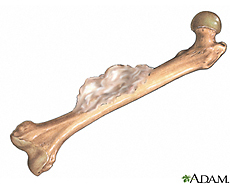 Primary bone cancer-if it is originated in the bone. Secondary bone cancer-if cancer spreads from other locations to the bone. Among all these types of bone cancer, osteosarcoma, chondrosarcoma and Ewing’s sarcoma are the most common types. Other types of cancer which can occur in the bone are lymphoma and multiple myeloma.Lymphoma develops in lymph nodes but basically it begins in the bone. Multiple myeloma is a bone marrow cancer and affects bone marrow cells so it is not a true bone cancer. The different bone cancers are named for the location of bone in which they originate and cause particular symptoms of bone cancer. A doctor takes several steps to stabilize the bone by injecting glue or reinforcing the bone with a steel rod. At present there is no proper cure of bone cancer and it develops when tumors from other areas moved to the bone and then spread to the whole skeletal system.